Art critique and weekly columnist for New York Magazine Jerry Saltz is also an active user of the social networking website Facebook. Using the formula of the “status update” Jerry has brought forth topics of discussion that have resulted in hundreds of comments from other Facebook members. The comments have been at such a high level of interest and proliferation that the recent topic has not only been reposted four times, but has also lead Jerry (or actually with the help of Lauri Lynnxe Murphy) to commence upon an expansion of his Facebook profile into a group site currently titled: “Jerry Saltz: Seeing Out Loud” Below is the original status update and topic of discussion as well as what I wrote in response. I respect Jerry both as a critic, writer and individual and love that he is so readily available to spark thought, dialogue, and general banter within the art community and beyond. Feel free to offer your own feedback below and/or join the facebook group! 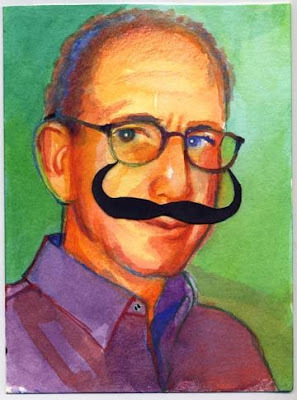 Also to commemorate this post or repost I have decided to resurrect “Jerry-stache”, one of my original moustache paintings. Jerry Saltz (3rd Repost): The Museum of Modern Art practices a form of gender-based apartheid. Of the 383 works currently installed on the 4th and 5th floors of the permanent collection, only 19 are by women; that’s 4%. There are 135 different artists installed on these floors; only nine of them are women; that’s 6%. MoMA is telling a story of modernism that only it believes. MoMA has declared itself a hostile witness. Why? What can be done? Ken Johnson: I’d trade a few matisses for some interesting women. i’d give up the Waterlillies, too, but, of course, that’s not going to happen. also, remember that big stupid monolithic phallus by barnett newman that they put up in the atrium when the museum opened? whose idea was that? that person should be fired — or thanked for revealing the museum’s phallocentricity. I agree on retiring Motherwell. But please bring back Balthus. Is Gottlieb on view? Could do without him. Must be some color field work from the 60s that could go, too. Also, I realize that I’ve been officially back from Ghana for two weeks now and apologize for the slow down of posts. I’ve been slowly settling back into my New York life. I’m going to continue working with Lyle and also hope to check out some gallery/museum exhibitions shortly so stay tuned!